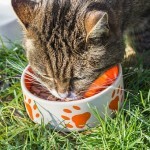 Plastic bowls have been traditionally used for feeding cats and they are typically sturdy. However, they have a couple of minus points. Firstly, several cats are allergic to plastic and develop a skin disorder on their chins, similar to acne. Secondly, plastic has a tendency to nick and scratch, and in those tiny fissures, germs thrive. Therefore, if possible, it’s better to avoid plastic bowls for feeding cats. Stainless steel is sturdy, unbreakable, dishwasher-safe and harmless to cats. Most veterinarians recommend them and ceramic bowls. Ceramic is another good choice for cat feeding bowls, provided it should have lead-free glaze. Cats are very keen about cleanliness, so, they won’t eat or drink from dirty dishes and bowls. Even dry food has adequate moisture and fat in it to leave a coat in the bowl. Rinse dry food bowls too daily and pass them through a dishwasher at least once every few days. If you feed canned food to your cat in the bowls they should be run through the dishwasher daily. The shape of the bowl should be such that the cat can get access to food easily, i.e. its mouth should be wide enough. It should not be with straight sides to prevent tipping over to make a mess. Size of the bowl should be sufficiently large to hold a portion of a size of a meal of cat food (i.e. one or two cups). 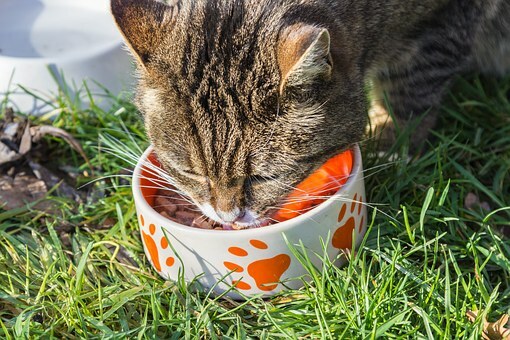 Nowadays, several ‘designer’ cat food bowls are available with ‘place mats’. These mats are useful to anchor the bowl and also to catch any drops that may spill out. You can even make your own place mat by using disposable items, like cardboards or carpet remnants. Even plastic ‘human’ placemats are nice. They are inexpensive, can be wiped off and don’t soak liquids that drop on them. Times come in the lives of all of us when there are emergencies when we have to be away overnight or have to work late. At such times, an automatic cat feeder is the best solution. These range from simple battery-operated feeders that open at the set time to electronic feeders that can be programmed for many days. So, choosing feeding bowls should not be a difficult issue, but you should do it with keen attention.